Could a new building for tools, tractor and a small office be part of the next management plan coming from the public consultation report to be released next month? 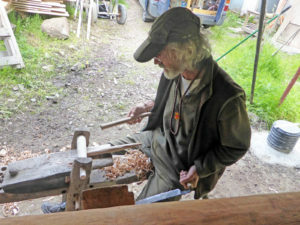 Would it be possible to build it as a green wood working project/workshop, involving members in the learning and experience and have it made largely from trees from Wilkies Wood? If so what might it look like, where might it go, what might be the right size and who might be willing to oversee such a project? 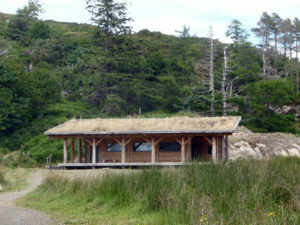 To gain inspiration and try to answer some of these questions, three FHT members visited the green wood craftsman Henry Fosbrooke working on similar buildings in the far north-west of Scotland for the Assynt Foundation. Kajedo, George and Jonathan from the FHT worked with Henry and helper John under the rain protection of a large open canvas tent wafted by the light smoke from an open wood burner to keep the summer midges down. Their time there was brief but the atmosphere was truly creative, nourishing and inspiring. It was fascinating to see the craftsmanship and precision involved as Henry worked using round softwood timber and green oak pegs with laser level and shave horse to produce robust, aesthetic and functional buildings; a centre for the arts, a large functional barn and his most recent creation, a shelter and work space for a large pottery kiln. It was clear that it does take skill and effort to transform locally sourced wood in this way but if a number of hands were available, the end results could be exceptional. Seeing structures gave ideas of dimensions and design that could be used in the Hinterland woods – 9m by 10m with a mono-pitch roof giving enough room to get both tractor and trailer under cover, tools and a space to keep FHT papers and books together in one place. The present shed is falling to bits and trustees now feel that it is more appropriate if tools and storage space are separated from those shared for personal use. The most likely location would be near the forest edge by the present entrance to Wilkies Wood from north Pineridge. Henry would certainly be open to sharing his skill and coordinating this venture if we were to go ahead. Have a look at some more impressions of the visit.